Elliot Tiber's life before Woodstock was not exactly groovy. He'd given up his job as a Manhattan designer to move back home to Bethel, N.Y., and try to bail out his parents' money pit of a motel. He was closeted, nagged and guilted by his mother and reviled by the struggling community he was trying to help. Woodstock wasn't shaping up to be groovy, either. What would be the 1969 three-day rock 'n' roll event of the century had momentum, money and music on deck. What it didn't have was a place to perform. Enter Tiber, the 34 year-old president of Bethel's Chamber of Commerce. As he writes in his new memoir, Taking Woodstock (Square One Publishers, $24.95), ''I typed up a permit, giving myself legal permission to hold a rock concert.'' The rest, as they say, is history. 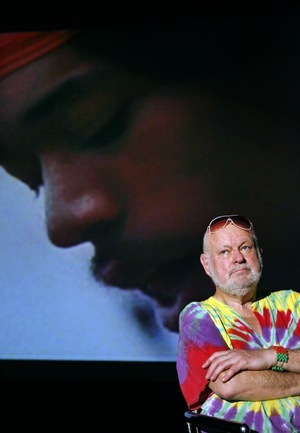 Tiber revisits that history not just in his book but in his docu-comedy Woodstock: Ticket to Freedom being screened at Fort Lauderdale's Cinema Paradiso April 1. ''Every day you meet people who say they're something. This guy's for real, down to earth, warm. He's a great asset to our community,'' says Hal Axler, executive director of the Fort Lauderdale Film Festival. Tiber's story has been optioned by Focus Features to be made into a major motion picture, commemorating the 40th anniversary of Woodstock next year. Not bad for a nice Jewish gay boy. Tiber brokered the deal, worked tirelessly with the promoters, and that summer, while crew worked to set up logistics for the concert, he housed them all at the El Monaco, thus saving his parents from going broke and giving Woodstock a home. Woodstock was a mecca for free spirits, but Tiber at the time wasn't one of them. ''I was closeted and frustrated and repressed and afraid to be myself,'' he admits. Much of that stemmed from his difficult relationship with his mother. Though Tiber's mother refused to accept her son's sexuality, Tiber is happily, openly out. He's being honored at a prescreening cocktail party sponsored by the Fort Lauderdale Gay and Lesbian Community Center. He's proud of who he is, a pride ignited by participating in the Stonewall riots but also, in no small part, by participating in Woodstock. The enthusiasm that made Tiber a vital force in the creation of Woodstock actually got in the way of him writing about it. In original manuscript of Taking Woodstock, he included not just the concert but everything that's happened to him since -- his 1972 move to Belgium; his partner of many years, director Andre Ernotte, who died in 1999; his 1976 literary debut, Rue Haute, a European bestseller published here as High Street; working on the film version of Rue Haute, an Academy Award nominee for best foreign film. The result was a sprawling 575-page manuscript Tiber tried for years to condense. ''I just couldn't do it,'' he says. So he worked with Tom Monte, an author best known for books on healing. In an odd way, it was a perfect pairing. Monte kept the focus on Woodstock and on Tiber. ''My work was about finding the heroic in Elliot and putting that on the page,'' Monte says. It wasn't hard. The Tiber of Woodstock days ''had an amazing amount of energy. He worked so hard and he was an incredibly creative man doing everything he could think of to keep his parents out of the poorhouse and keep that hotel alive. He was also really smart,'' says Monte. After Woodstock, Tiber finally found a buyer for the El Monaco, but Woodstock pilgrims shouldn't go looking for it. ''The owner burned it down. There's no sign, no trace, nothing,'' says Tiber. ''Maybe bringing back the Woodstock nation would stir some people to think -- but that's a dream,'' he says. ''The world is all turned upside down. Unfortunately, the younger generation is on crack and busy partying.'' Um, weren't there a few drugs at Woodstock? ''I was the only one out of 1 million who didn't smoke a joint,'' he says. ''Well, maybe I did. Everybody was doing it.'' Even his straight-laced parents accidentally ate hash brownies. ''It was the only time I saw them laugh in my whole life,'' he says. Tiber agrees. 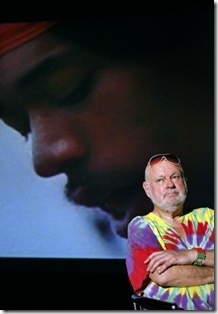 His favorite part of his film is where he talks with Richie Havens, Woodstock's opening act. Tiber has a Yorkie named Molly Picon? Or is it just Molly? My Name is Bella, really Isabella. But shoot Does Elliot Tiber still have the dog? how the book became an Ang Lee movie? read above here. scoop! Award winner is also a story that Shur tells with relish. interview show to promote his latest film, Lust, Caution (色,戒). chatting with him about his book." from him, and gave him a sly wink." did just seem to come to him." Taiwan-born Hollywood director Ang Lee (李安), 53, is tackling a new movie project, a comedy this time, about America’s famous Woodstock hippie music festival in 1969. Titled Taking Woodstock, the film’s screenplay was written by longtime Lee collaborator James Schamus, 49, from a book by Elliot Tiber with the same title. Tiber’s memoir was quietly published with little fanfare in 2007 by a small publisher in New York, but now the book, subtitled A True Story of a Riot, a Concert, and a Life, has become Lee’s entree into the world of film comedy. It’s tentatively set for a premiere in New York on June 26, 2009 — according to several movie Web sites — near the 40th anniversary of the 1969 Woodstock festival. The three-day concert took place in the middle of August of that year. Rudy Shur is the president of Square One Publishers, a book company in New York, which bought the book and released it in 2007 without really knowing if there was a Hollywood movie in it. But 10 months after publication, a movie deal was signed with Focus Features in New York. Focus Features is owned by NBC Universal, with James Schamus serving as the independent studio’s CEO. Tongues are already wagging on blogs and Web sites about what Lee’s take on the Woodstock era will be like. The principal location shooting in upstate New York is set to be completed by the end of this month, according to Variety magazine, a film industry publication. In am e-mail interview about how the book and movie sale came about, publisher Shur, 62, explained the book’s curious backstory. Despite Shur’s advice to take his book project to a bigger publishing company, Tiber kept coming back to him and Shur finally said that he would take on the book, but with the same earlier reservations he had expressed before. The book’s genesis was complicated. “The story he wanted to tell was basically all Elliot, but to tell it in a manner that presented a balanced story in the way that I was looking for meant calling in a co-writer, Tom Monte,” Shur said. “Elliot’s normal writing style was very creative and stream-of-consciousness, but I wanted more of a traditional story narrative. I had worked with Monte before, so I signed him to put Elliot’s material into the style I was looking for. The title of the book, and the movie, also has an interesting backstory. Shur said the title was the brainchild of Square One’s marketing director, Anthony Pomes. “Woodstock was a moment of freedom as well as a coming of age for a new generation in America,” Shur added. The story follows Tiber, who is gay but hid his sexual orientation from his family, and includes his participation in the Stonewall riot in New York, which helped fuel the gay-rights movement. When the book was first released, there were only a few reviews since Square One was not a large publisher and did not have the same kind of marketing clout as the larger book companies in New York. But the reviews were nevertheless positive, and slowly, word of mouth began to spread at book Web sites and blogs. “We could see a real ‘grass-roots’ interest starting to build around the book,” Pomes, the marketing director said. How the book became a Hollywood movie to be directed by an Academy Award winner is also a story that Shur tells with relish. It turns out that Lee was also scheduled to appear on that same interview show to promote his latest film, Lust, Caution (色,戒). This story has been viewed 134,370 times.